* Please see the "What's Included" tab on this page. Are you an educator looking to reinforce specific topics with your students? 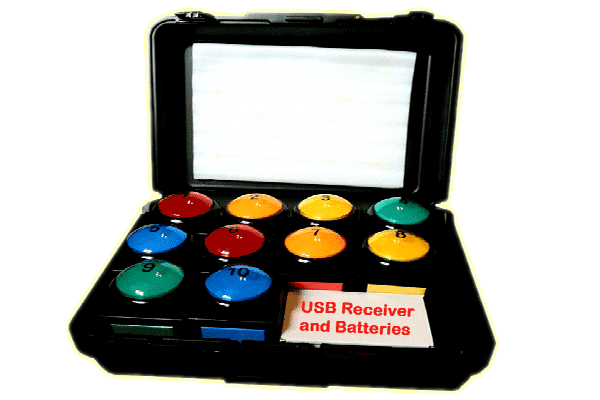 Do you need a wireless buzzer game as easy as possible to set up and use? Are you looking to improve your business prospects, entertain your customers and have venue owners clamoring to book your services? Are you looking to embrace new technology to give your trivia night the edge? Do you want your players leaving your trivia night eager to return? 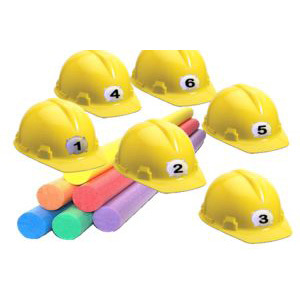 Do you require something that looks and feels professional? The Trivia Cubes is the system you are looking for! 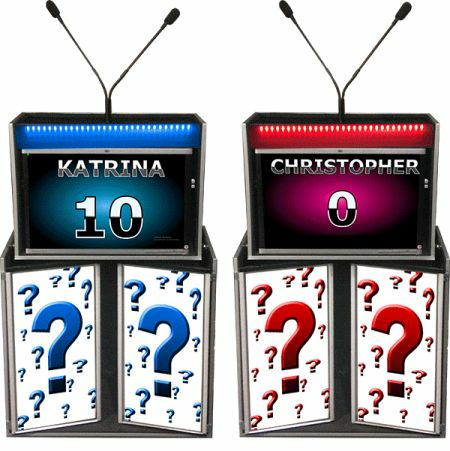 DigiGames presents the most innovative, creative and adaptable remote controlled buzzer system on the market created and designed with both the player and the "game show host" in mind. Hassle free, easy to use and extremely fun to play Trivia Cubes are at the cutting edge of trivia technology – where DigiGames has always been. 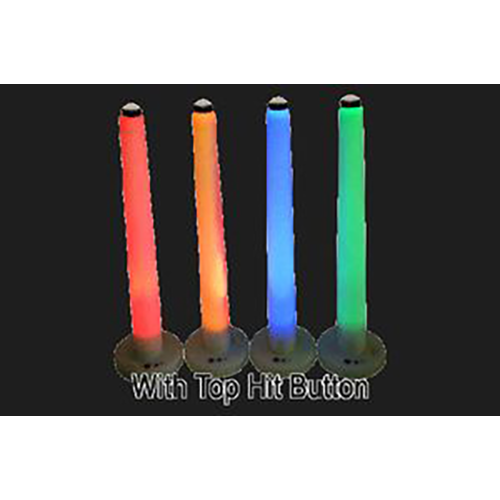 Our wireless trivia buzzer systems are used by educators world-wide for reinforcing topics within the classroom, team building games, fundraisers, and increasing student's scores. 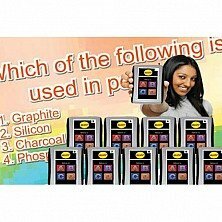 Trivia is a proven method for teaching in a fun game show style manner and increasing student retention in the topics you turn into a quiz show. Youths love touching and feeling a real game show buzzer. They also love flashing lights and earning points. All our products are durable under any conditions, meaning that the most eager of students excited to buzz in will not damage the buzzer. Educators love that there is no computer required to use these wireless buzzers. Trivia is a competitive industry and you need to stand out from the crowd. Initially, you need to make sure you are getting booked and what better way to impress in a sales pitch than to have the innovative, creative and visually stunning trivia cubes on hand to make sure you are hired! It is going to be so much more appealing heading into a venue with these cubes than trying to sell a pen and paper quiz event! Clients love to hear that the show will be a success without the concern of any computer failure. This is because with our stand-alone wireless buzzer trivia systems there is no computer required. 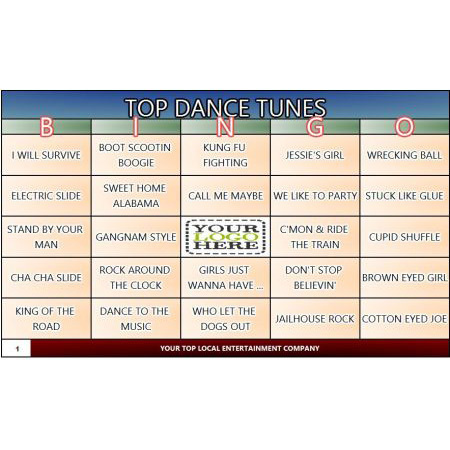 Trivia players are always on the lookout for something different and something fresh to entertain them. Your job as a host is to get people into the venues and one sure fire way of doing that is to embrace new technology. 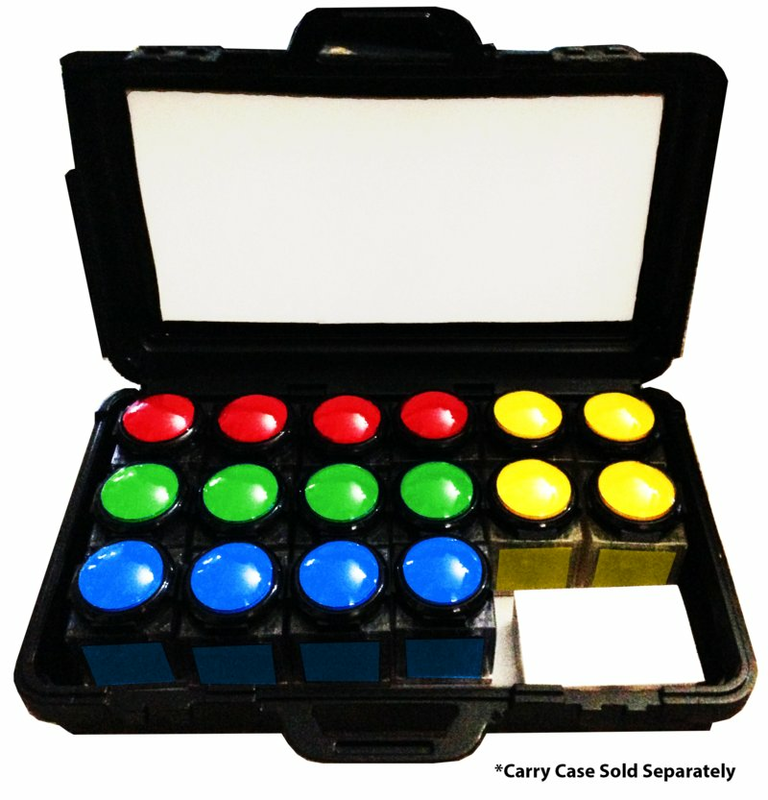 With Trivia Cubes your job as a trivia host just got easier. Combine that with your custom trivia questions and you have an all-round package that will entertain and excite players leaving them thirsty for more! If YOU aren’t embracing technology your rivals will. In the cut throat world of the trivia business this could be a vital difference between success and failure! 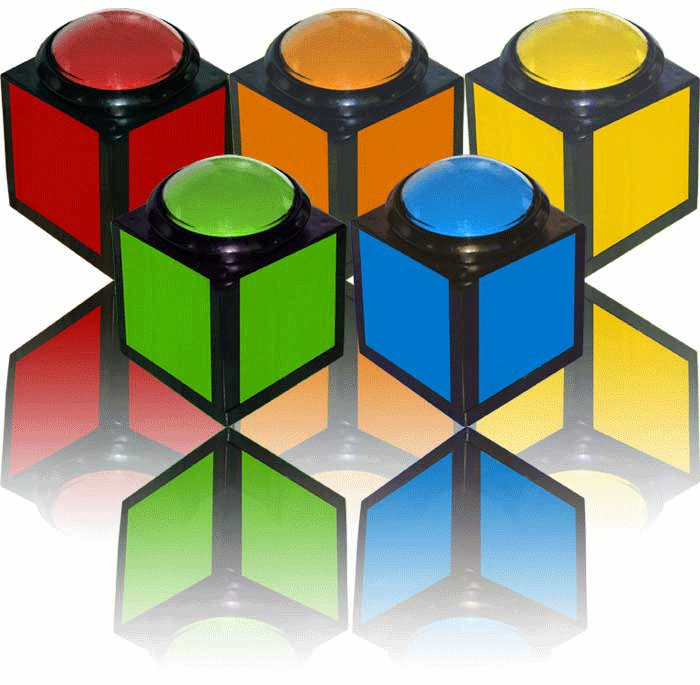 The Trivia Cubes Wireless Buzzer Systems are easy, simple and quick to setup and operate. As a trivia host we appreciate you do not want to spending time with computers and software. DigiGames has designed the wireless trivia buzzer systems for this environment! The stand-alone version does not even require a computer making it far easier for you to control the game and requiring less equipment for your night. Perfect for the trivia host who enjoys traveling light or if you have restrictions on space or you want to be able to do a spontaneous trivia show without having to bring a computer and launch a software game. 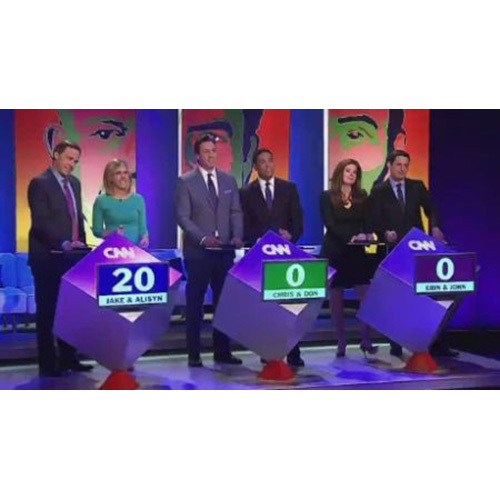 Using the appealing, visually striking and professional Trivia Cubes will help your players feel as if they are part of a real TV game show. Combine these with your presentation, lights, effects and backdrops and you can turn any venue into something close to game show studio. 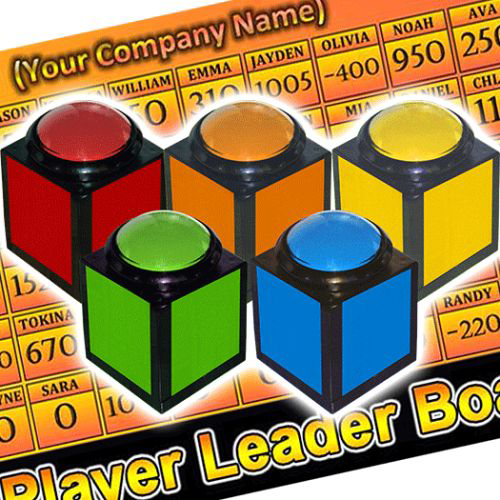 Trivia Cubes are perfect for Trivia nights in venues and for corporate occasions. 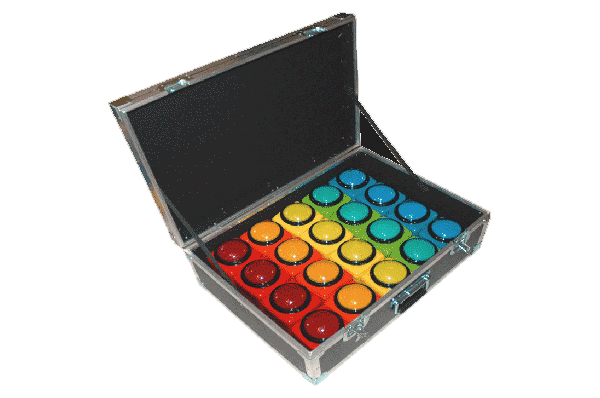 The Trivia Cubes Wireless Buzzer System has another major strength – it can literally be used on any trivia occasions. Trivia nights in bars, fund raisers, corporate functions. 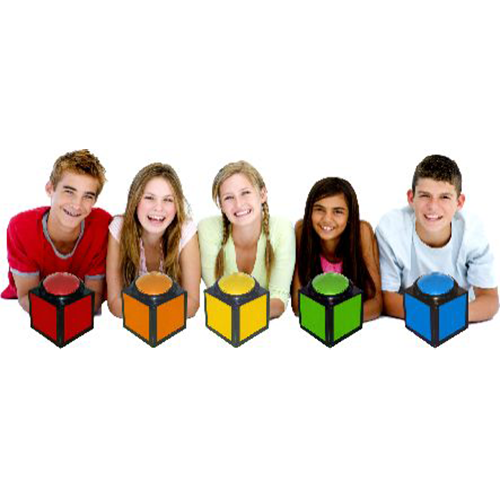 Birthday parties, post-prom parties, academic quizzes….you name it and the Trivia Cubes will provide fun, reliability and entertainment from start to finish. 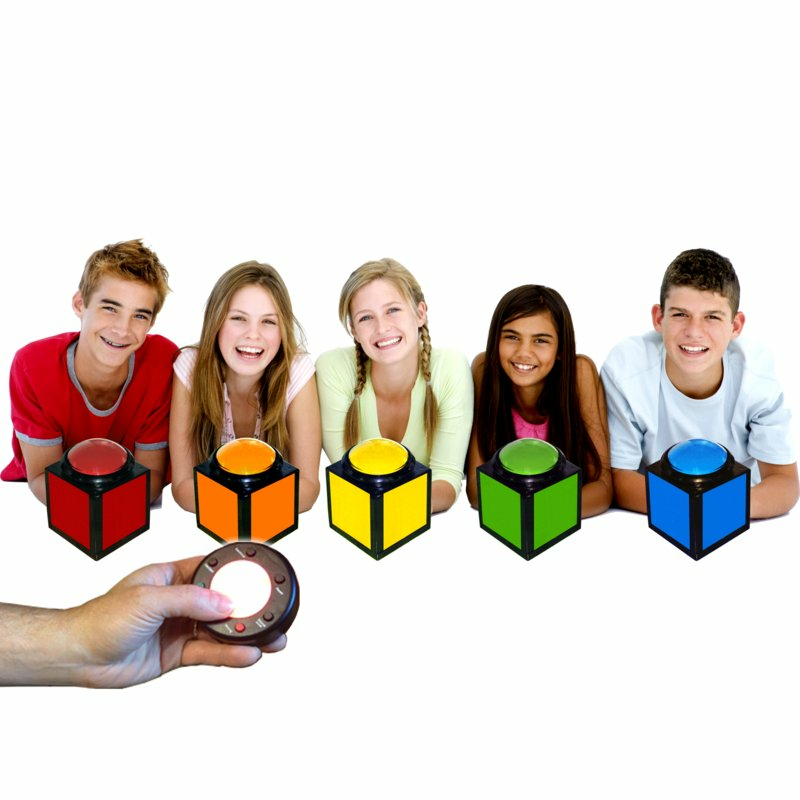 Wireless Buzzers Trivia Cubes - Why add these to your trivia events? This stand-alone version works without a computer. You have complete and direct control of the system with a provided remote control ("Host Remote" included with purchase of 5 or more wireless buzzers). First contestant who rings in locks out the other contestants. The wireless buzzers light up to provide identification of who buzzed in first. Made from shock resistant durable ABS - ideal for extreme abuse applications. Combine together as many as 800 stand-alone Trivia Cubes. 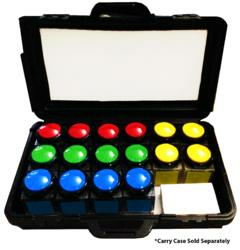 Measuring 4 inches cubed (10cm x 10cm x 12cm), your entire trivia quiz game show system is easy to transport. Out of the box with a 500' range (150 meters). Easy changeable AAA batteries last 2 years or 50 quiz shows of normal use (batteries included). Easily expandable. You can buy some now and add more to your existing system later. 1. Ask your question. Trivia players 'buzz in' with their answers by pressing on their wireless buzzer. 2. The player to buzz in first will see their wireless buzzer BLINK, signaling that he or she has the 'go-ahead' to answer the question. All other player buzzers do not light up to signify that their buzzers are deactivated. 3. If answer is wrong: Press the CONTINUE button on the "Host Remote". The player will be locked out and cannot ring in again. Any other incorrect players during the question session are also locked out. 4. If answer is correct: Press the RESET button. All the buzzers will release and the next question can now be asked. DigiGames is a market leader in the design, creation and implementation of cutting edge trivia technology. With nearly 2 decades experience, we provide a reliable, passionate and trustworthy service to meet your trivia needs. As with all our products the Trivia Cubes Wireless Buzzer System comes with on-going support from your dedicated and professional customer service teams. Our ambition is for our customers to succeed and we will do everything we can to make that happen by not only providing quality, appealing and exciting products but giving you the support you require. EXCITEMENT, FUN and INNOVATION for your players, APPEAL, PROFESSIONALISM and PROFIT for you! Order your personal set of cubes today! NOTE: The remote control ("Host Remote") is not included when less than 5 Trivia Cube buzzers are ordered. 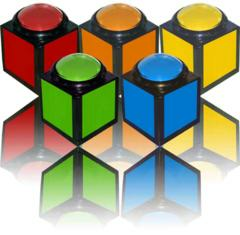 Your order of 5 Trivia Cubes or more will include a host remote. If your order is less than 5 Trivia Cubes you can order the host remote separately. 1. Turn on the game show system and the Host Remote. 2. Ask a trivia question. 3. The participant to buzz in first will see their wireless buzzer light up, signaling that he or she has the 'go-ahead' to answer the question. All other participant buzzers do not light up to signify that their buzzers are deactivated. 4. If a contestant answer is wrong: Press 'NO' on the Host Remote. Other contestants now have the opportunity to answer. If a contestant answer is correct: Press 'YES' on the Host Remote. All the buzzers will release and a new question session can begin. 5. Repeat until all the questions have been used in the session and declare a winner and give them a prize (bragging-rights works too!). Made from durable ABS plastic with colored rubber side bumpers - ideal for extreme abuse applications. Each unit measures 4 inches cubed (10cm x 10cm x 12cm). Your entire trivia quiz game show system is easy to transport. Out of the box with a 500’ or greater range. Each Trivia Cube includes AAA batteries. Host Remote with purchase of 5 or more buzzers. The host remote allows you to control the system from a distance. The host remote has controls that allow you to reset contestants, lock them out and enable/disable sound effect. If your order is less than 5 Trivia Cubes you can order the host remote separately. Phone and email support for life. This is a Stand-Alone product. You can also consider our computer-controlled products with software games.